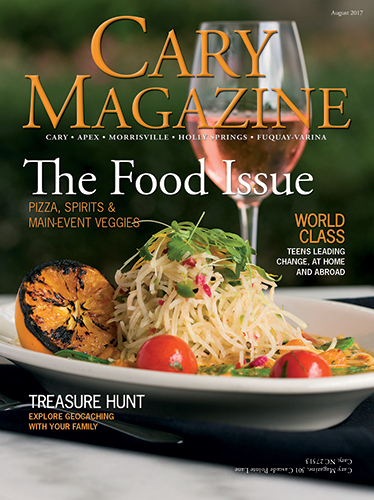 It doesn’t take a crew and pirate ship to go treasure hunting — you can do it right here in the Triangle. 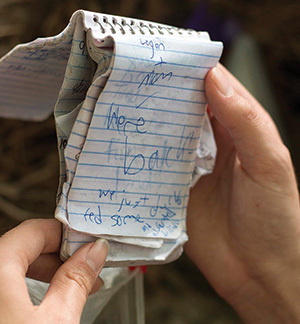 In 2000, GPS enthusiast Dave Ulmer hid a bucket of small trinkets in the woods with a notepad and pen. He posted the coordinates of his “treasure” in his blog for others to find using a GPS locator. When he checked back a few days later, he saw that some of his followers had logged their names in the book. Little did he know, Ulmer had created geocaching. 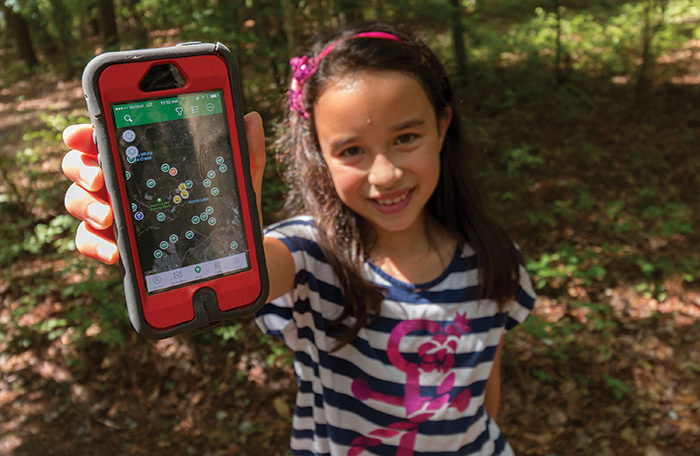 Delaney Feung searches for caches using the geocache app on her father’s phone. Delaney and Alexis search their treasure to find something to take. In exchange, Delaney leaves a toy strawberry. 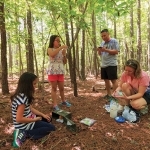 Within seven miles of Cary, there are more than 1,000 geocaches to be found behind bushes, in tree nooks and under picnic tables. Geocachers can look for these treasures based on the latitude and longitude directions the owners post on geocaching.com. 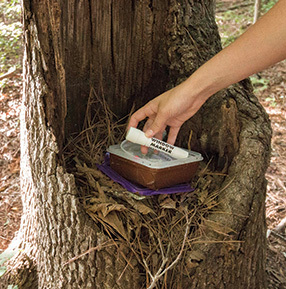 Geocaching used to require a special GPS locating device — now all you need is a smartphone. “I think the real explosion here lately in geocaching has been that everyone carries a smartphone now, which is GPS enabled,” Snow said. 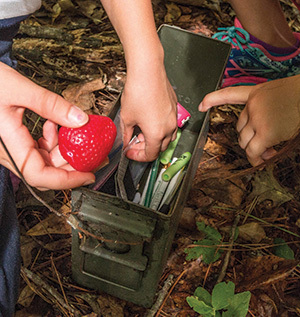 To make your own treasure, all you need is a notebook, a pen, and a waterproof container — anything from Tupperware to a military surplus ammo can. If you want to have a little more fun with it, you can add themed toys or trinkets. When your cache is ready, find a good hiding spot. 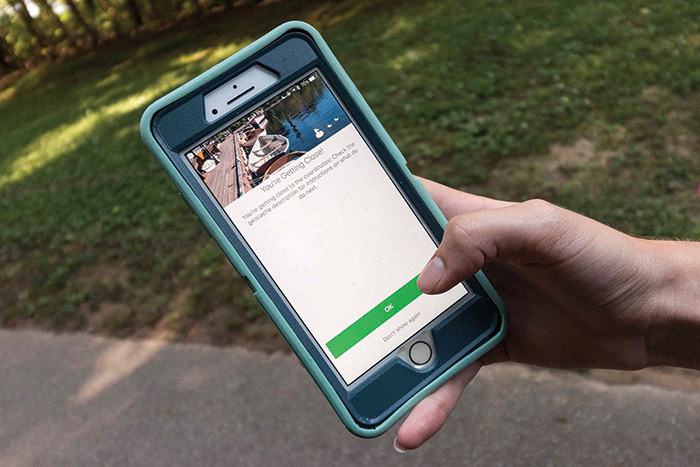 Then, sign up your cache on geocaching.com with the size, difficulty and terrain of the search. If you want, give your stash a punny name like “Gnome Sweet Home” or “The Swarm — You’ll Bee Missed,” two Cary geocaches. You can also leave comments, hints or pictures to make it easier for others to find the cache. 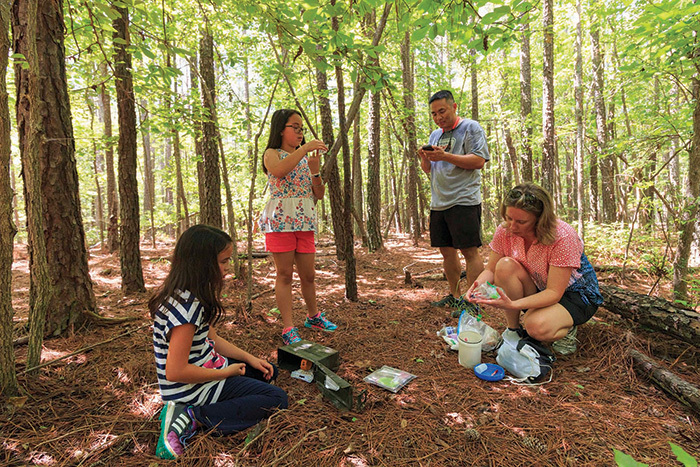 Nolan Feung helps his daughters navigate Harris Lake County Park using the geocaching application on his phone. 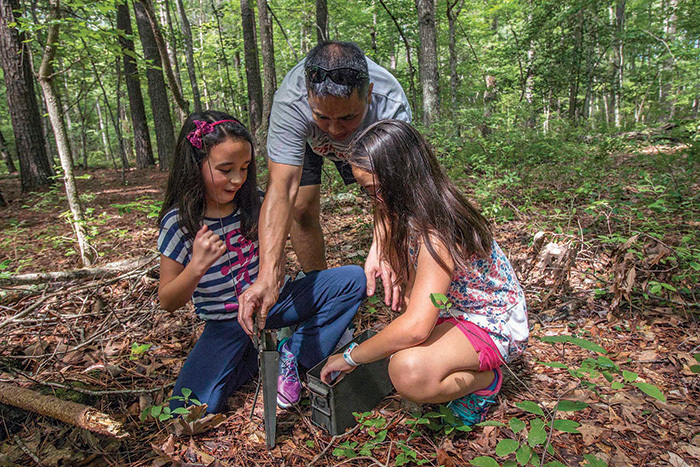 Delaney, left, looks in awe at the findings inside the geocache she found with her family. Jan Patterson, right, searches her bag of goodies to choose what to leave behind for the next geocaching group. Alexis Feung, 10, helped her family find a cache at Harris Lake County Park that hung about six feet off the ground, camouflaged by leaves. “It’s like playing tug-o-war with a tree!” said her younger sister, Delaney, 8, while working the pulleys that lowered the green ammo can. Once you find a cache, it’s advised to package it up as you found it, and hide it for the next person to find. 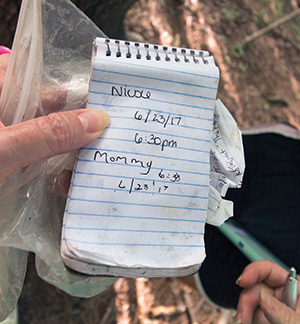 “Try to hide it better than you found it,” said Nolan Feung, who likes to take his family geocaching when his daughters aren’t in school. His wife, Jan Patterson, says the family has traveled as far as Phoenix to find a cache, and they hope to hit a few more states as they continue their treasure hunting. Bill Ferriter, a Salem Middle School teacher, also likes to geocache when he travels, and prefers to hunt in urban areas. His favorite city for geocaching is Minneapolis, where he can enjoy the activity while touring a place he loves. 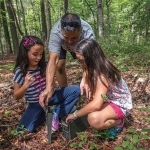 Why go geocaching with your kids? 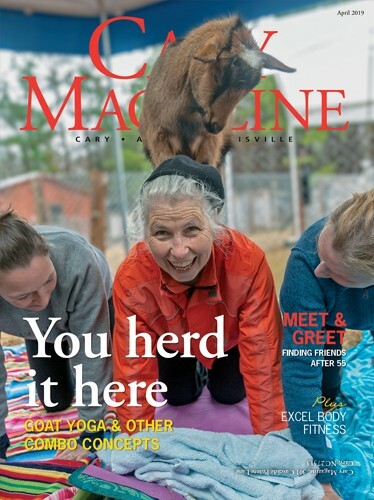 In 2005, as part of a geography lesson, Ferriter’s sixth-grade class put a Salem Middle School keychain in a geocache near the RDU Airport, where geocaching travelers typically stop to pick up a few “travel bugs” to bring with them. The key chain eventually traveled 34,000 miles, and had been placed in 90 caches in four countries, before it returned to Apex eight years later. 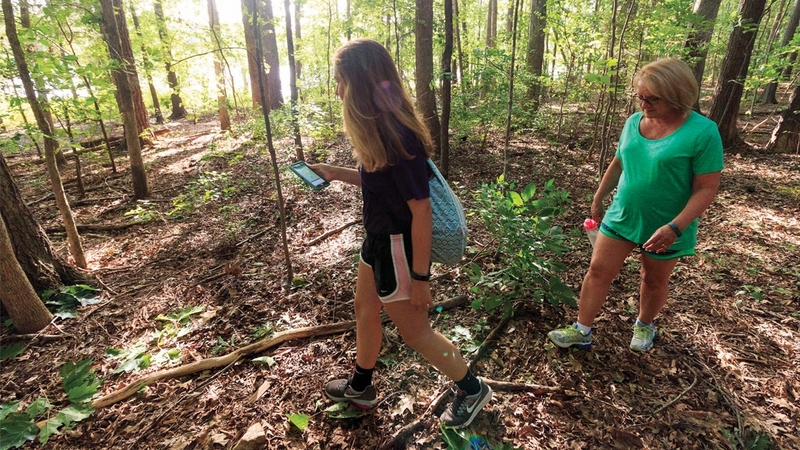 Ferriter says geocaching gave his students a reason to enjoy learning about geography as they followed the keychain’s travels across the world. 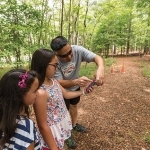 Jackie Trickel, assistant park manager of education and programs at Harris Lake County Park, says the hobby appeals to kids for lots of reasons. 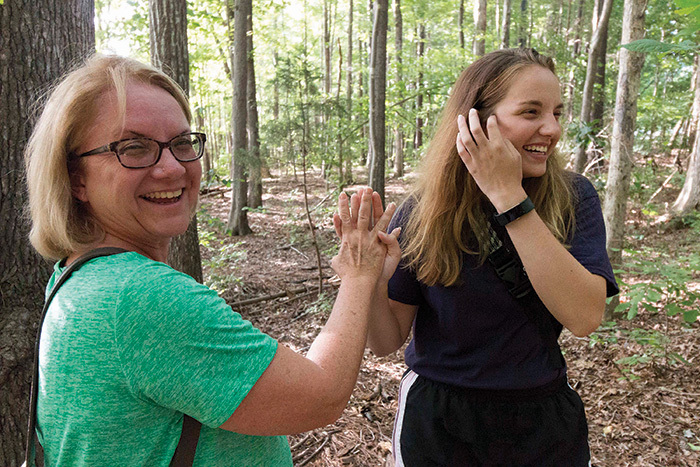 Kim, left and Nicole Howren high five in celebration after finding their first cache together. Nicole searches her purse to find one item beside her keys and phone, a window marker. It goes in the cache. 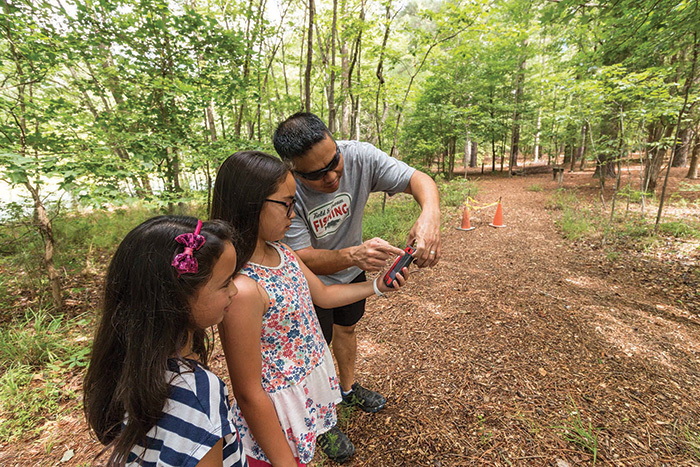 The park in New Hill holds events for first-time geocachers, where attendees learn what a geocache is, learn the GPS equipment and get a few pointers from experts. Trickel says to start slowly and do your homework, choose local caches that are easy to find, check the online comments and move up from there. To learn more, visit geocaching.com/play/search.